put you in direct contact with electricity. · Avoid washing your hands, showering, bathing, doing laundry, or washing dishes. · Stay away from windows and doors. Stay off porches. 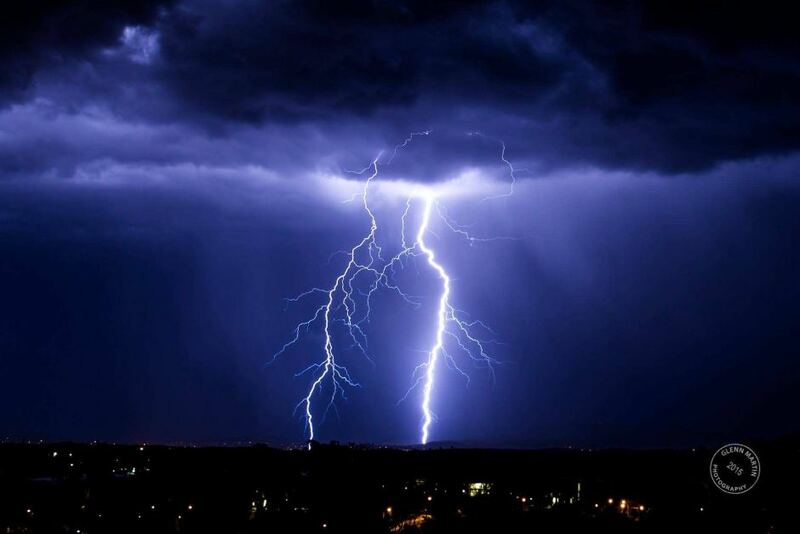 · If you can hear thunder, you are within striking distance of lightning. · Seek shelter immediately in a building or a hard-topped vehicle. · Do not go under trees for shelter. There is no place outside that is safe during a thunderstorm. · Wait at least 30 minutes after hearing the last clap of thunder before leaving your shelter. · Stay away from windows and doors. · There is no safe place outside. Places with only a roof on sports fields, golf courses, and picnic areas are not safe during a lightning storm. Small sheds should not be used. · If you are in or on open water, go to land and seek shelter immediately. between your knees. Make yourself the smallest target possible and minimize your contact with the ground. This is a last resort when a building or hard-topped vehicle is not available. · If a person is struck by lightning, call 9-1-1 and get medical care immediately. 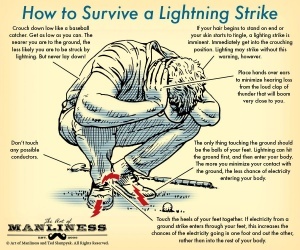 Victims of lightning strikes carry no electrical charge, so attend to them immediately. Administer CPR if you know how and it is needed. APRIL WEEK 2 WILDFIRE – ARE YOU PREPARED?